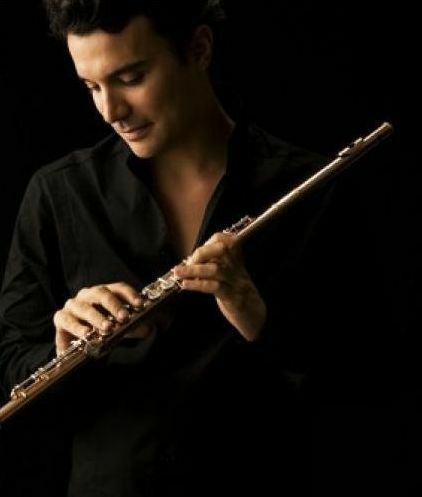 After having hold the principal flute position of the prestigious Los Angeles Philharmonic under Gustavo Dudamel, Julien Beaudiment is now principal flute of the Lyon National Opera House and teacher at the Conservatoire National Superieur de Musique de Lyon. Brilliant representative of the French flute school, he crosses the channel and studies at the age of 18 years old at the Guildhall School of Music and Drama in London with Paul Edmund Davies and Averil Williams. He stays there 2 years and then finishes his studies at the “Conservatoire National Superieur de Musique de Paris” with Sophie Cherrier, assisted by Vincent Lucas and Michel Moraguès for the Chamber music. He successfully gets the “Premier prix” in flute and chamber music. His studies enabled to rub shoulders with other great professors, such as Maxence Larrieu, Benoit Fromanger, Ransom Wilson, Joshua Smith, Genevieve Amar and Jacques Zoon. From the Hollywood Bowl in L.A to the Suntory Hall in Tokyo, threw the Amsterdam Concertgebouw or the Royal Albert Hall in London, he plays in the most beautiful halls in the world within the Simon Bolivar Orchestra of Venezuela, London Symphony Orchestra, the London Philharmonic, the Philharmonia, the Academy of Saint Martin in the fields, the Hallé orchestra, the BBC National Orchestra of Wales, the Scottish Chamber Orchestra, the Beijing National Opera House, the Paris National Opera Orchestra, l’Orchestre de Paris, l’Orchestre National du Capitole de Toulouse, l’Orchestre National de Bordeaux, l’Orchestre Philharmonique de Strasbourg, the Lausanne Chamber Orchestra, conducted by Gustavo Dudamel, Esa Pekka Salonen, Christoph Eschenbach, Sir Colin Davis, Michael Tilson Thomas, James Conlon, Yuri Temirkanov, Vladimir Jurovski, Kirill Petrenko, Manfred Honeck, Thomas Hengelbrocht, Philippe Jordan, Ivan Fischer, Kazushi Ono, Semyon Bychkov, Charles Dutoit, Edo de Waart, Sir Roger Norrington, William Christie, Emmanuel Krivine, Evelino Pido, Raphael Fruhbeck de Burgos, Lionel Bringuier, Stephane Denève, Christian Zacharias, Louis Langrée, Thierry Fischer, the musicians Joshua Bell, Murray Perahia and Itzhak Perlman, and the composers John Adams, Peter Eötvös, Matthias Pintscher, and the Hollywood star John Williams. A chamber music enthusiast, he is a prize winner of the Barcelona International Competition for duo sonata with the pianist Laetitia Bougnol. He performs beside artists like Lawrence Foster, Emil Tabakov, Jonathan Stockhammer, Enrico Onofri from the Giardino Armonico, Stefano Montanari, Antal Szallai, Eric Crambes, Guillaume Sutre, Sarah Nemtanu, Raphael Oleg, Françoise Gnéri, Tasso Adamopoulos, Hartmut Rhode, Adrien Boisseau, Marie Pierre Langlamet, Christine Icart, Isabelle Moretti, Kyung Hee Sutre, Lluis Claret, Richard Hardwood, Raphael Chretien, Herve Nkaoua, Celimene Daudet, Jean Francois Zygel, Denis Pascal, Ishiro Nodaira, Oliver Triendl, Ariane Jacob, the French jazzman Antoine Hervé, the members of the Vienna Philharmonic, the Bavarian Radio Orchestra, the Munich Philharmonic, the Berlin Philharmonic, the Los Angeles Philharmonic, the Psophos and Diotima Quartet, the flutists Maxence Larrieu, Philippe Bernold, Rachel Brown, Michel Moraguès and Sophie Cherrier. He accompanied the dancers and choreographers Regine Chopinot and Benjamin Millepied playing the Bach Partita, and varied his activities by recording with the British singer Sarah Brightman at Abbey Road in London, or in studios during the Los Angeles years for the series Battlestar Galaktica and Doctor Who, collaborantes with the actors Seth Macfarlane and Julie Andrews, and played with the pop stars Antony and the Johnsons, John Legend and the Latino Ruben Blades. Teaching is also a big part in his schedule. Beside teaching at the Conservatoire National Superieur de Musique de Lyon, where he is appointed after Philippe Bernold and Maxence Larrieu, he is in great demand for masterclasses worldwide, in the USA, Europe and Asia. He regularly teaches at the Nice International Summer Academy and the “Académie Internationale d’été des Arcs” in the french Alps.